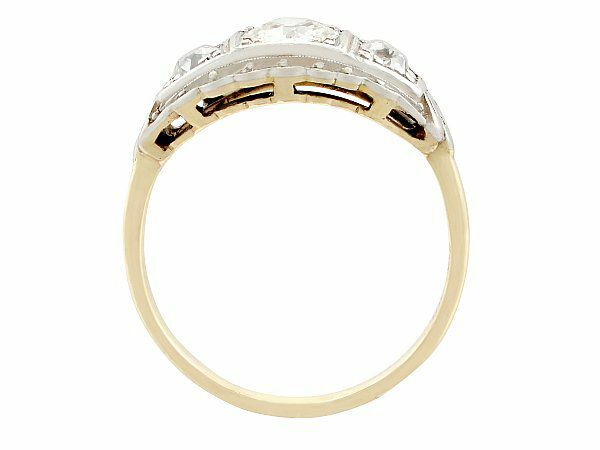 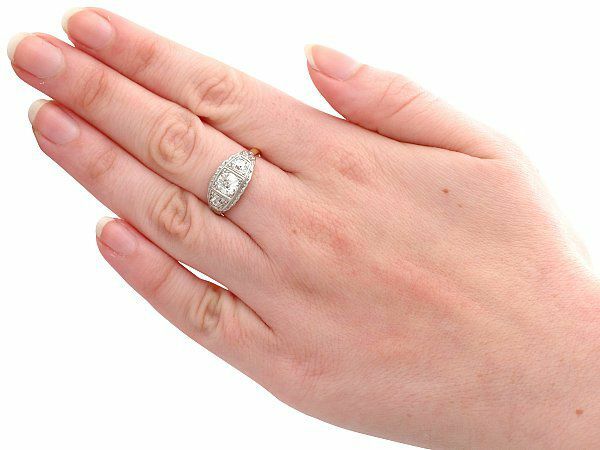 This stunning antique diamond ring has been crafted in 14 ct yellow gold with a 9 ct white gold setting. The impressive domed pierced decorated design is ornamented with an impressive 0.70 ct old European round cut diamond flanked by two slightly smaller old European round cut diamonds. 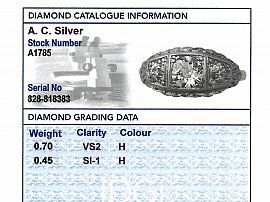 The diamonds are all independently displayed within a raised angular decoration consisting of a square and two pentagons. 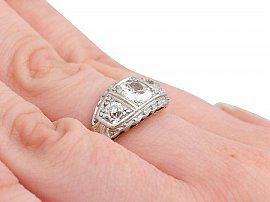 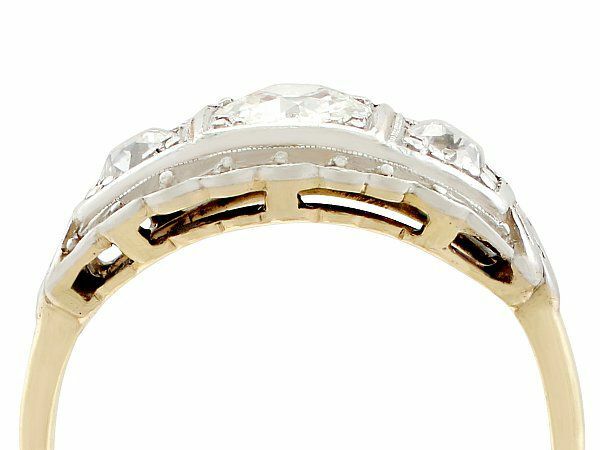 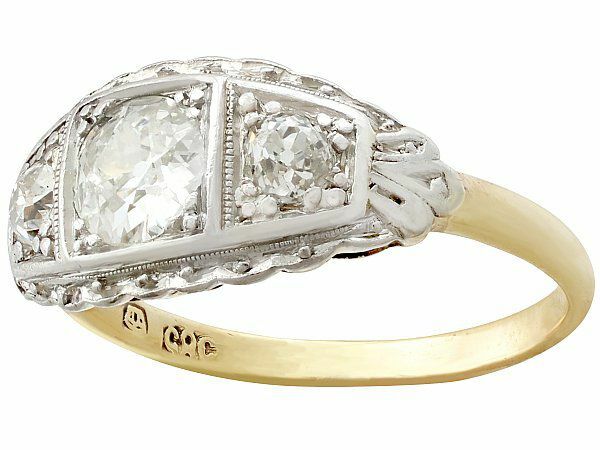 The outer edge of this 1920s ring is embellished with a scalloped border emanating from the incurve of the central arrangement. 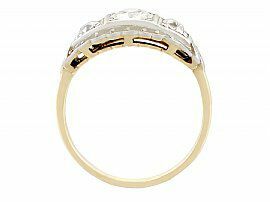 The hallmarked 14 ct yellow gold ring shank subtly integrates into the overall design at the shoulders. The posterior portion of the ring shank is plain and unembellished. This 1920s diamond dress ring is supplied with an independent diamond grading certificate for the feature diamond in addition to a diamond grading report card (shown) for the supporting diamonds. This ring's setting has been independently tested using state of the art technology (Niton XL2 Analyzer) and verified as 9 ct gold. 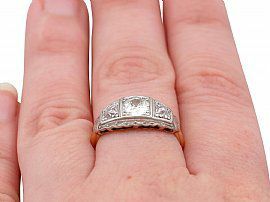 This diamond dress ring is fine quality, set with very high colour graded, very high clarity graded old cut diamonds. The ring is a very good gauge of gold and is in excellent condition with a very clear 585 and crown struck to the inner shank. 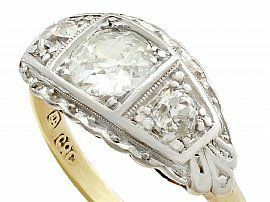 Reflections in photographs may detract from the true representation of this impressive example of antique jewellery / estate jewelry.